Hello, y'all. I am still recovering from my concussion, but I am slowly starting to feel better. So, I got back to work. Well, I did a little work. I have been filling in the floor cracks. It's tedious to be sure. I may be done by 2015 and you can come revel in my craftsmanship or floormanship or whatever might be the appropriate wording here. 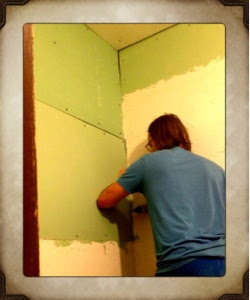 You can see that my man filled in a hole of drywall for me. That was amidst Holy Week. It was crazy. It's kind of like the Superbowl of church events. There is something to do every single day and night. It's a flurry of activity leading to the cross and the resurrection. He still accomplished one thing and I will revel in it and hold on to joy. May God be glorified in that tiny slab of drywall. I hope you know that I make light of things in order to stay sane in the midst of an insane remodel while parenting small children. I mean, I plant a head of lettuce and I'm a farmer. We have to laugh at ourselves or our perfectionism will drive us to being ungrateful for what God has accomplished. I am an incredibly private person. I process life alone in the quiet with the Lord. When I felt like He wanted me to start blogging our life journey, I was a bit hesitant because I am resistant to letting the judgmental, the critical, the self-righteous, & the ugly into my deep emotions and struggles. I knew God wanted me to be vulnerable and expose myself to their callous nature in order for them to see a heart yearning for Christ instead of comparing to each other. I also knew that God wanted me to write this journey out for me. It's how I process. It is hard to share our struggles. I have learned to share them because I think that denying their presence steals glory from God. If no one is aware that they are there, the fact that God lifted you up and delivered you from them every single day is never seen. 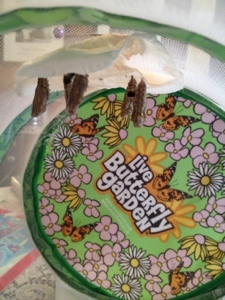 We are waiting for the butterflies to emerge from the cocoon here in homeschool. I have had so many epiphanies during this whole thing. Stay tuned for a future blog. Love y'all. We are trying to pick out a countertop. Which of these do you like? I am leaning toward Blanco River, Giallo Nova, Lagoon, or Lyra. I am absolutely delighted you listened to The Lord about sharing your heart & life with the world by blog. I have just begun to read via Gomer's House reposts on Facebook. I'm inspired by your words. I too process by getting it out in words, but tend to blab them to whomever crosses my path that day. I like your still calm voice better than my vulnerable on the spot babbling. Well, it doesn't seem like babbling at the time, only when I look back in regret. It takes great strength to put your words in text for all to see over and over again. You go girl! I've hoped to meet you for some time. Denbigh was a guest in our church about a year ago. He endears your family in hearts around him.